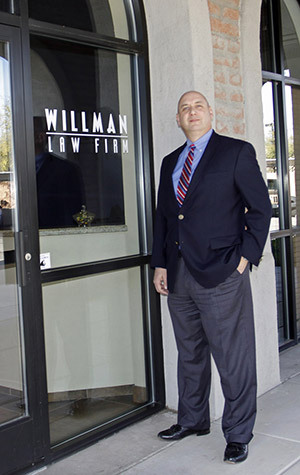 Paul Willman’s practice emphasizes family law, estate planning, probate, guardianship and conservatorship. Paul represents clients in all phases of litigation including discovery, pre-trial hearings, order to show cause hearings, settlement conferences, and trial. Paul provides individual service in preparing estate planning documents including wills, trusts and powers of attorney. In addition, he represents clients in probate, guardianship and conservatorship matters administering estates and protecting minors and incapacitated individuals and their assets. Paul has practiced law since 1994. He is appointed by the Court regularly to represent children in family law matters and individuals in guardianship and conservatorship matters. He serves as a Judge Pro Tem for the Arizona Superior Court. Paul has served as a settlement Judge in over 100 family law and probate settlement conferences and continues to serve on a regular basis. In addition, Paul presides as Judge Pro Tem in mental health hearings. Intern/Law Clerk for Assistant U.S. Attorneys (Civil Division). Researched and prepared memoranda regarding various civil law issues. Assisted in preparing for and conducting depositions and other aspects of civil litigation. Intern/Law Clerk for the Honorable Lawrence H. Fleischman. Assisted Judge Fleischman in preparing for numerous settlement conferences. Discussed and reviewed negotiation and settlement techniques employed in settlement conferences. Information Officer. Acted as a liaison among various state departments and agencies to respond to and resolve constituent inquiries and concerns. Assisted in the development of the State’s official response to the Exxon Valdez oil spill. Represented the Governor’s Office at numerous functions and presentations.